The 10 Mile and 5K start at 7:00 AM on Cesar Chavez east of Lamar Blvd. See course maps here. Both races finish on the South First Street Bridge. The Kids K (9:15 AM) starts and finishes on the South First Street Bridge. Sunrise on race day is 6:45 AM. Average weather at sunrise is 51 degrees with afternoon highs averaging 72 degrees. Dating back to 2009 the average temperature has been 52 degrees at the start. The Loop Running Supply co.
Sunday Nov. 3, 2019 5:30am – 6:30 am (limited for participants who live 20 miles outside of Austin) *Please note race day packet pickup is at The Loop Running Supply co. just a short walk to the start line. New this year: Create a team! Win Prizes! Click here for more information! Race results for 2007 - 2018 are available HERE. The 10-Mile and 5K utilize chip timing. Results will be available shortly following the finish and posted near the start line. 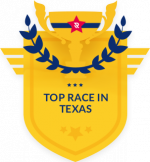 We've been Named a Top Race in Texas!